IREPS Works Tender: How to See Live Works Tenders by Date? Anonymous users can see the tender document of live works tenders by searching the tender through Advanced Search or you can view the tenders By Organisation, By Type or By Date. Here i am describing that how you can see the live works tenders of different zones of Indian Railways by their Closing Date. Open the home page of IREPS ie. www.ireps.gov.in, and click on E-Tender >> Works >> View Tenders >> By Date you will find two options Opening Today and Opening in Next 3 Days. After clicking on Opening Today link you will see the list of all Railway Zones of Indian Railways with the total number of tenders which have the closing date of today for bidding. Click on action icon against a railway zone to see the list of all published tenders which are closing today. Click on Tender Number Link to see and download the tender document of a particular tender. After clicking on Opening in Next 3 Days link you will see the list of all Railway Zones of Indian Railways with the total number of tenders which have the closing date for bidding in next three days. 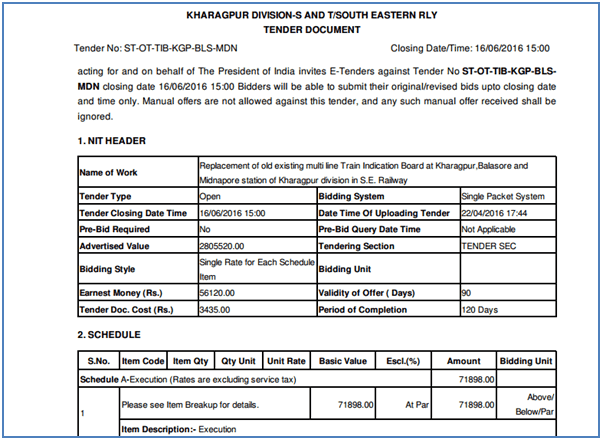 Click on action icon against a railway zone to see the list of all published tenders which are closing in next three days.